SAN FRANCISCO (Sept 13, 2018) – The Exploratorium announced this week the launch of its new Global Climate Change Explorer, a website created to give the public firsthand experience with climate data. Announced as part of the Exploratorium's 2018 Climate Press Kit, the website presents scientific climate data from NOAA, the National Weather Service Climate Prediction Center, NASA, and numerous other international agencies and organizations. The data is organized into five areas of exploration: Atmosphere, Oceans and Water, Ice, Land and Living Systems, and Looking Ahead. This allows users to find their own way through the evidence and develop a personal connection to the processes scientists use to investigate and monitor climate change. The climate exploration website is a redesign of the Exploratorium's original Global Climate Change Explorer, launched in 2002. "We've changed a lot from the original site," says Kevin Boyd, lead science writer on the project. "We have some new and better climate datasets, and together they present a much clearer picture of how quickly our planet is changing. The site's design is dramatically different, and we've changed how we talk about climate change–drawing upon communications research showing how best to help people understand Earth's climate system." The website is part of a robust set of Exploratorium programs, tools, exhibits, and artworks focused on connecting the public to environmental and climate science. "At the Exploratorium we emphasize 'science' as a verb, rather than a noun," says Executive Director Chris Flink. "We're more interested in igniting curiosity and building personal connections to the processes of science than presenting people with a set of facts to be learned. We create extraordinary learning experiences that upend perceptions and inspire brave leaps forward–and we're committed to supporting our governor in his efforts to gather policy-makers, leaders, and experts from around the world to focus on mitigating the impacts of climate change." The 2018 Climate Press Kit includes information about how the Exploratorium connects scientists, artists, researchers, and policy-makers with the public through programs at the Fisher Bay Observatory and beyond. 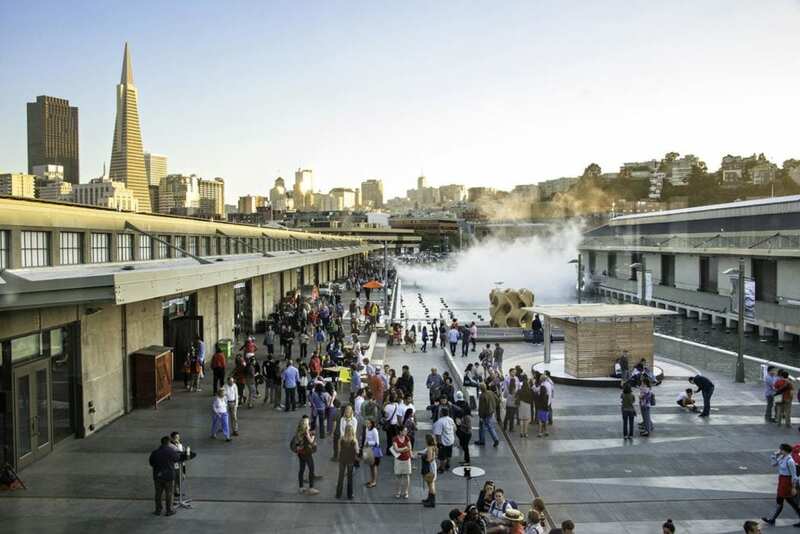 Also included are links to the Exploratorium's environmental galleries, exhibits, experts, and art installations. Notable among the artworks is Rosten Woo's forthcoming sound installation, Mutual Air, which will place "bells" that chime in response to hyper-local particulate matter and global CO2 data throughout Downtown and West Oakland. Press and the public are encouraged to attend Innovation and Climate Adaptation in San Francisco Bay on Wednesday, September 12. 6:00 P.M. – 8:30 P.M. and After Dark: Climate on Thursday, September 13. 6:00 P.M. – 10:00 P.M. Press interested in attending additional Global Climate Action Summit events taking place at the Exploratorium should contact [email protected]u. The Exploratorium is a portal to the astonishing scientific phenomena that animate our world and shape our actions. We create extraordinary learning experiences that ignite curiosity, upend perceptions, and inspire brave leaps forward. Since 1969, the Exploratorium's museum at Pier 15 in San Francisco has been home to a renowned collection of exhibits that draw together science, art, and human perception, and that have helped change the way science is taught. Our award-winning programs provide a forum for the public to engage with artists, scientists, policy-makers, educators, and tinkerers to explore the world around them. We celebrate diversity of thought, inspired investigation, and collaboration across all boundaries.